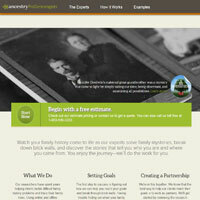 ProGenealogy is brought to you by Ancestry. It’s made up of a team of specialist researchers who help their clients to find hard-to-uncover information about their ancestry. The team has more than 150 years’ worth of combined experience in the field, each specializing in particular time periods and regions. The first thing you need to be aware of when considering Pro Genealogists is that this is an expensive service. The reason is that it’s labour intensive, requiring a specialist to take on your case and find information which might be buried deep in various archives. So, you might expect to spend thousands of dollars for some pieces of information, depending on how long it takes them and the costs they incurred during the hunt. Some customers have been displeased by the research reports they were provided with, suggesting that they paid a lot of money for very little information. This is part of the gamble with paying for research, but it’s worth considering how far you’re willing to go and how much it might all set you back before you begin the process. You can view examples of completed projects through ProGenealogists.com. These include specific case studies. Alternatively, you can explore the “Who Do You Think You Are?” section of the website, where you can learn about the lives and ancestry of celebrities. There’s very little to do on the website, as it’s primarily a shop front to encourage you to give them a call. You can submit your query and await a response, including a free estimate, but remember that an estimate is not a quote and they are not bound to keep to that price, so it could increase. Exploring the list of experts is something else you can do to help identify which individual might be best for your case. Other than this, though, there’s little unearth. The site has no tools for you to perform your own research, and very little to read. If you are stuck in your research and want the assistance of professional one-on-one support, ProGenealogists might be worth a shot. However, it’s expensive and there’s no guarantee you’ll actually get the information you’re hoping for. We advise talking to the sales team to help establish the likelihood of their success and the potential cost of acquiring the information.